I’m second to none in my admiration for the great rhythm and blues singer Lavern Baker. Her hit records, like “Jim Dandy,” “I Cried a Tear,” and “Saved” led to her 1991 induction into the Rock and Roll Hall of Fame. Even the greats can go astray, though. In her 1960 recording of “Bumble Bee,” she sang “You hurt me like a bee/a bumble bee, an evil bumble bee.” Wrong! Bumblebees rarely sting and, as native bees, play a little-known but vital role in pollinating flowers and crops. In fact, growers of greenhouse tomatoes deliberately establish bumblebee colonies in their facilities for pollination purposes. As I learned from Bee Basics, aside from bumblebees, most other species of native bees are solitary. They build nests in the ground, in dead trees and, in the case of a number of parasitic “cuckoo” bees, in the nests of other species. Thousands of species exist, many with very specialized tastes in pollen and nectar, those protein-laced plant products that convinced prehistoric wasps to give up their carnivorous wasp-ness in favor of a vegetarian diet. The southern blueberry bee pollinates – wait for it – blueberry bushes, while squash bees pollinate cucurbits (pumpkins, squash, and zucchini to me). Competition from honey bees, environmental degradation, and pesticides all are hurting many of these interesting and literally life-giving insects so, to quote Arthur Miller, “attention must be paid” by all of us who benefit so mightily from them. 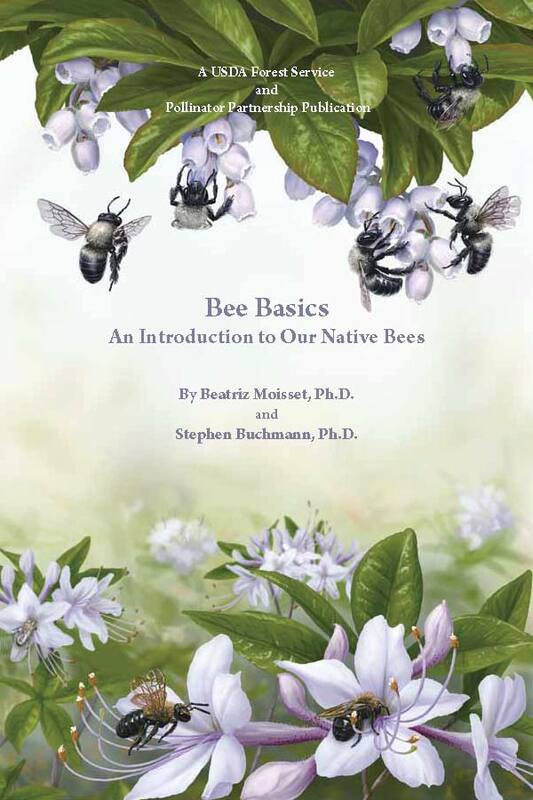 Bee Basics is written for the layperson, provides a huge amount of biological and ecological information in fewer than 50 pages, and is available here for you to read. You can also find it in a library. This entry was posted on Wednesday, June 29th, 2011 at 9:23 am and is filed under Agriculture, U.S. Forest Service. You can follow any responses to this entry through the RSS 2.0 feed. You can leave a response, or trackback from your own site. I can’t believe some of the above comments…. Good book! Bees play an important role in pollinating flowering plants, and are the major type of pollinator in ecosystems that contain flowering plants. Bees are one of the most important insects on our planet! MATRIX!! !OUR SUN IS NOT REAL , IS A MIRRAGE!!! (ANCIENT GREEK NAME).THIS IS THE BIGGEST SECRET!!! MUST BE DESTROYED!! !AND THE FORCES OF LIGHT WILL DESTROY IT VERY SOON!!! Interesting read and didn’t get stung. Epipen at my side just in case. As long as I don’t get stung…. I’m good! Nice post!